The Aktepe, was decorated with meaningful painted figures who formed an integral part of the burial complex as a symbolic place of afterlife in the beliefs and ritual needs of the Lydians. The two figures participate in the creation of a dignified well attended resting place for the person buried here and reclining on the couch. The attendants may be interpreted as symbolic servants of the dead person who undoubtedly also had the privilege of a perennial banquet or drinking supply in the lost furnishings of the tomb. As represantatives of the development of Anatolian wall painting, these figures, once they have been carefully examined by experts, will take an important place in the growing series of archaic and classical style paintings that have come to light through controlled excavations in western Anatolia. We now know that tomb chambers in Lycian, Pisidian and Lydian regions were provided with appropriate wall paintings to support the symbolic setting of the burial and the passage of the deceased to a blissful state in the hereafter. The persons in the Aktepe paintings provide care, comfort, and magic protection to the person buried. Head of the male figure on the left wall of the aktepe chamber. The role of wall paintings in expressing and strengthening the ideals of afterlife in Anatolia under Persian rule is to be studied better in the future when further discoveries are made in tumulus chambers from Lydia, Phrygia and Lycia. Wall paintings even appeared in early 6th century BC context in the timber tumulus chamber of Tatarli, south of Afyon. New fragments of a timber grave with Persian battle scenes of early 5th century type have turned up in Munich, far from their undetermined place of origin The knowledge of wall paintings of c. 500 BC in the Usak and Manisa area tomb chambers will encourage archaeologists to continue the search for and protection of previously undiscovered tumuli with decorated chambers. The paintings are an essential part of the record of funeral rites and beliefs as well as of the history of Anatolian art in the Persian period. Relia such as costumes and hairstyles, equipment and technology do not allow a stricter separation of Greek and Lydian in the tomb paintings of Aktepe. In any case, the problem of transfer arises also in the analysis of East Greek and Anatolian costume, with clear indications of Anatolian originality. The style of the Aktepe paintings, so far as can be appreciated in the poorly preserved and damaged figures cut out ruthlesslv in 1968, gives us a view of Lydian adaptation of figural art shared bv lonians and Anatolians. The development of Greek wall painting in the 6th century BC is scantily documented in original samples. 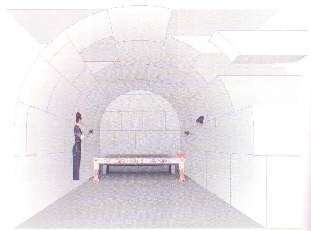 The significant traits of a major art are lost because in Greece itself it was not applied to monuments of archaeological longevity such as underground tomb chambers. Small scale replicas of larger painted designs in light-ground vase painting or on votive pinakes can bring us closer to the typical Greek (Corinthian, Rhodian, Chiote, Samian) rendering of human figures and animals in outline and colour. The symbiosis of Greeks and Lydians in the western zone of Anatolia makes it difficult to tell Greek and Lvdian manners of rendering and subject matter apart; this is true of all arts, but subject to conjectural analysis in wall painting) where comparanda are so scarce on the Greek side while Etruscan parallels pose their own questions. As we look at the facial type of the young woman and man in the Aktepe tomb, we can link them with some of the figures painted on the walls of a semi-subterranean room (shrine?) in Gordion, 4 a context probably to be dated to shortly before 500 BC. As discoveries of wall paintings have fortunately increased in Turkey over the last two decades, we can statistically support the assumption of Anatolian-Lydian wall painters at work in their own idiom as the creators of the Aktepe and Gordion paintings.